Home National News & Views New Orleans Malik Rahim for Congress Dec. 6! Three years since Katrina and the government continues to fail us. Malik Rahim has spoken out with courage, asked the difficult questions and built viable community alternatives. He is a strong organizer who acted while the politicians waited. Now he wants to take his courage to Congress. •	gutted over 3,000 homes and provided direct services to nearly 200,000 returning residents. Malik is in a winnable race for U.S. Congress in Louisiana’s 2nd District. The Louisiana Secretary of State changed the elections calendar after Hurricane Gustav, so the general election for that seat is on Dec. 6. “We still have one more Congressional election within our grasp,” writes Cynthia McKinney, legendary former congresswoman from Georgia and this year’s Green Party presidential candidate. “We all know the importance of having someone of conscience in the United States Congress, someone of unbending commitment to our values and not just another representative of ‘business-as-usual’ politics. “Malik Rahim proved his mettle when we all watched in horror as events unfolded in New Orleans and the Gulf States. What a shame that African-American Hurricane Katrina survivors have had to file a discrimination lawsuit against Louisiana’s Road Home program in order to earn their right of return. “With Malik in Washington, our own internally displaced population can finally see justice – and not just abundant hot air – delivered from the halls of the U.S. Capitol. We need Malik now and now Malik needs us. “Four days after Hurricane Katrina and two days before founding Common Ground, I made this decision to run for Congress,” Malik writes in a recent email to friends and supporters nationwide. “This decision was made due to the lack of government response to Katrina. My hope is that never again will any disaster turn into such a tragedy. “This is a winnable seat – a seat not just for residents of the New Orleans area but a peoples’ seat for all those who stand for environmental peace and justice. This goal can only be reached with your support. “I will provide concrete alternatives to the wars being waged against our communities at home and to the wars continuing abroad. Our communities deserve no less. I will continue to advocate for safe, affordable housing, the establishment of universal healthcare, and invest in a comprehensive storm protection system and wetland restoration. I would initiate repeal of the so-called Patriot Act, author legislation to remove FEMA from the Department of Homeland Security, demand an end to the costly and senseless incarceration of nonviolent offenders and advocate for full funding for our schools. Running a viable campaign requires funding. “Now with the election imminent, the campaign has set a goal of raising an additional $20,000 by Friday, Nov. 28. With your help, we can achieve that end. You can contribute on the campaign website at www.VoteMalik.com. “I also urge you to get active with our campaign. Canvass your neighborhood and tell your friends and family. If you are out of town, we need additional volunteers on Election Day and the week leading up to the election. You can phone bank remotely from home or promote the campaign online. Pat LaMarche, Green Party candidate for vice president in 2004 and for governor of Maine in 2006 and author of “Left Out In America: The State of Homelessness in the United States,” writes in the Bangor News: “I’m staying just a few blocks from Jefferson Davis Parkway. His statue has withstood everything the elements could throw at it since it was set in place back in 1902. “Back then Jefferson Davis was still classified as a traitor. He led a great civil war against the United States of America and wasn’t pardoned until 1978 when fellow Southerner Jimmy Carter set the issue of his treason aside. “When looking at the weathered monument, it’s really not so remarkable that the statue withstood the ravages of nature as it is that it withstood the test of fair play and decency. Why wasn’t this statue angrily torn down in the dark of night, after a lynching, during the civil rights movement or after America watched what happened to Saddam Hussein’s statue in Iraq? “Certainly that treatment of the Iraqi ruler – and the response of the American public to it – set an example of what to do with tributes to those who tortured, enslaved or executed people simply because of ethnic or cultural differences or because the victims rebelled against such treatment. “But I’m not in New Orleans now to study history, but because it is the center of Louisiana’s 2nd Congressional District. This year Hurricane Gustav landed in bayou country forcing area residents to evacuate. This disruption in everyday life also interrupted the political season. The district’s voters were then given more time to vet and select their United States representative. “If you were here, you’d admit that this part of the country, with its vivid reminders of its failing infrastructure, sure needs adequate representation. Then again, if you went up the Mississippi River about 2,000 miles to Minneapolis – where a bridge collapsed last year killing 13 and injuring 145 – you might argue that the whole country needs more adequate representation. “So this election, rescheduled to Dec. 6, is pretty darned important to the fourth-largest import city in the U.S. Because it will send a voice to Congress about the need to focus our political attentions back home where we can rebuild infrastructure while we recover from this recession, it’s pretty important for the rest of the country, too. 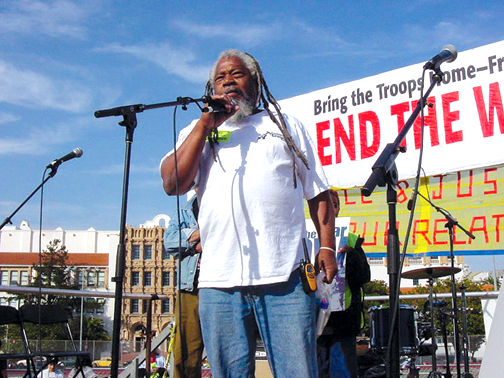 “One of the candidates, a community organizer and activist named Malik Rahim, is running a campaign based on the message that ‘strong people need good representatives.’ Malik – a man who stayed behind after Hurricane Katrina struck, built the first post-Katrina medical clinic and provided desperately needed coordination for disaster relief – further explains that ‘weak people need strong leaders’ but ‘strong people need good representatives.’ He knows how strong the people of New Orleans are and he has proved that working together they can rebuild a city destroyed – not by natural disaster – but by disastrously poor government. “There are two other candidates in this race for Capitol Hill and, while seemingly fine people, they are mere footnotes in this battle between the man who stayed behind rescuing lives and providing health care and the incumbent congressman who used the privilege of his office to retrieve his personal effects with the help of a ‘5- ton military truck and a half-dozen military police,’ even as his constituents languished torturously in the flood. “Malik Rahim never got his things rescued because Malik Rahim never left. He stayed behind and opened his home as a distribution center for water, food, clothing, blankets and cleaning supplies. Since then he has stayed in New Orleans, rebuilding homes and helping his neighbors move back. He leaves the area only to raise money and recruit volunteers to help with his rescue organization, Common Ground Collective. Check out CommonGroundRelief.org to learn more. •	Ensure our region gets the resources we were promised to continue our recovery. •	Fund category 5 (100 Year) flood protection for all of Southern Louisiana. •	Develop Comprehensive Storm Protection by maintaining and preserving ecosystem services, including rebuilding our cypress swamps. •	Support economic and fiscal policies to strengthen working people and their families. •	Fund green job training to rebuild our crumbling infrastructure and provide pathways from poverty. •	Jumpstart the regional economy by supporting the Gulf Coast Civic Works Project. •	Invest in our public education system, including funding for smaller class sizes, so that every child is given the opportunity to excel. Education not incarceration. •	Remove high-stakes testing as the sole criteria for federal funding. •	Support a teacher’s right to collective bargaining. •	Ensure that every American citizen has access to quality affordable healthcare. •	Secure federal money to rebuild our health care infrastructure, including Charity Hospital. •	Establish and fund community health clinics. •	Decrease our country’s reliance on oil. •	Demand a shift to 20 percent renewable energy sources like solar and wind within five years. •	End tax breaks and giveaways to oil companies. •	Alternative sentencing for non-violent offenders. •	Bring the troops home from Iraq as safely and quickly as possible. •	Use the money that we have been spending in Iraq to rebuild infrastructure in the U.S.
•	Demand federal funding for the construction of affordable housing in the Gulf Coast. •	Call for a full investigation now on the awarding of contracts for the demolition of public housing developments in New Orleans and their reconstruction. •	Donors must provide their name, mailing address, occupation and name of employer. •	Contributions must be from U.S. citizens or legal residents. •	Contributions to the Committee to Elect Malik Rahim are not tax deductible. •	Contributions must be made from your own funds, not made by a corporation, labor organization or federal contractor. If you’re in New Orleans, be sure to Vote Malik in the Dec. 6 election! Early voting started Nov. 18 and runs through Nov. 25. Of everything we’ve seen this year, Malik Rahim’s campaign gives me the most hope – he is as admirable as the incumbent is corrupt, and his reputation in New Orleans gives him a actual chance of winning. Godspeed, Mr. Rahim.